Rescue workers walk among the crash site of a cargo airplane near the airport at Brazzaville, Republic of Congo yesterday. 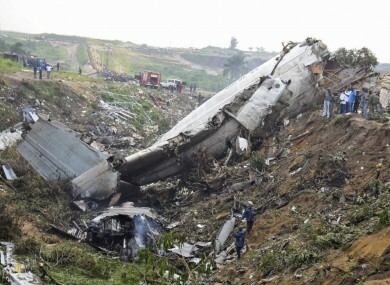 A CARGO PLANE crashed at Brazzaville airport as it was trying to land in a storm yesterday, killing around 30 residents and also the crew, emergency services and witnesses said. Around 30 local people had been killed as the plane skidded off the runway and crashed into houses and a bar in the Congolese capital before crashing into a ravine, said Georgelin Massemba, head of the emergency services. Earlier yesterday, emergency services had spoken of around 20 dead. Email “Around 30 people killed in Congo plane crash”. Feedback on “Around 30 people killed in Congo plane crash”.